Our group of five (Dave, Kellie, Kurt, Jeff, and I) headed for White Salmon Glacier on Mount Shuksan, hoping to find some nice snow but not planning to traverse the Upper Curtis Glacier or go for the summit. We brought normal avalanche gear, but decided against glacier gear (so Dave and I left ours in the car). A 6am departure from Seattle got us a nice close parking spot just after 8:30am in the rapidly-filling White Salmon Lodge parking lot at Mt Baker Ski Area. We skinned up the cat track towards Chair 8 at 9:20am, in very warm shirt-sleeve weather with blue skies and bright sun. Turned off the cat track at the usual place just before the bottom of the lift (snowmobile tracks here), beginning a quite-simple downhill traverse through the trees from 3800 ft down to 3400 ft to reach the west edge of the White Salmon Creek basin. All of the various gullies and avy chutes which cross this path are nicely filled in with deep snow, so there were no problems here as can often occur with less snowpack. Mount Shuksan from the start of the downhill traverse. Snow conditions in the basin were a solid frozen sun crust below 4000 ft, transitioning to a breakable sun-wind crust above that and then to dense wind-packed powder by 4500 ft. As expected, there were HUGE piles of avy debris in the basin here, most covered with a layer of last week's snow, but with some fresh debris from the previous day. 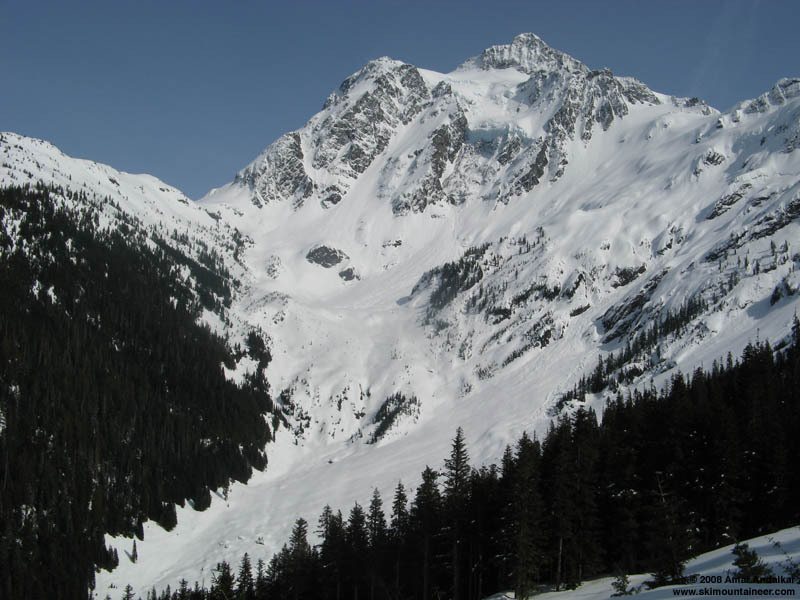 Above 5000 ft, the snow became lighter and fluffier on the 35-45 degree steep, north-facing slopes of the White Salmon Glacier, still unconsolidated powder despite receiving oblique sunlight on Friday afternoon and throughout the morning. Jeff set a great skin track up the entire glacier (ski penetration mostly 4-12", pole basket penetration 1-2 ft) and we saw a few skiers far above us who had traversed across from Shuksan Arm. Skinning up through the avy-debris-filled basin at the foot of the White Salmon Glacier (right), with the Hanging Glacier visible far above. Jeff setting the skin track up the White Salmon Glacier. Somewhere around 6000 ft and just after 12pm, I was following about 50 ft behind Jeff when I noticed a small, less-than-boot-sized hole in his skin track. Obviously a crevasse, so I decided to stride quickly across it and then WHUMP!!! A roughly 2 x 4 ft section of snow collapsed below me, pitching me forward onto my face and leaving me in an awkward spot: right ski dangling mostly free in the abyss, with only its tail touching snow, and left ski along the edge of the opening, with hands and poles trying to spread out my weight on the surface. I screamed for help and told Jeff to come back and help me, as the other 3 in our group were hundreds of feet below us and unable to quickly respond. My real fear was the uncertainty of whether more of the crevasse roof would collapse, sending me tumbling in for a drop of unknown distance. By the time Jeff backtracked and arrived several feet above the hole, I had quickly decided that the best way to extricate myself was to try to roll over backwards and right (downslope), which would send me tumbling downhill on the steep slope and away from the crevasse edge. Somehow the maneuver worked, although in retrospect, I don't think I'd normally have either the strength or the flexibility required to pull it off--must have been adrenaline. After a brief tumble backwards over my head, I found myself sitting mostly upright, about 8 ft downslope of the opening and completely covered in powder, but thankfully safe and still bathed in sunshine rather than darkness. Jeff standing above the hole where I punched through, about 5 minutes after the incident. So there it was: after 12 years of ski mountaineering, having skied well over 50 different glaciers in the Cascades, many of them unroped and a significant fraction of them solo, I had finally taken my first crevasse fall (of sorts) on skis. Although I had once before punched through while on foot, a single leg thigh-deep, that was while roped up and instructing at a glacier skiing / crevasse rescue field trip on the Nisqually Glacier, several years ago. And that very minor incident had produced none of the fear, panic, and uncertainty of this totally unexpected event. After seeing the initial small hole, I had decided to continue across it, assuming wrongly that it was probably an incipient, foot-wide type crack, and not the much larger gap that it in fact was. There were no obvious clues that I saw on the slope that there might be a hidden, shallowly-roofed crevasse, and even after punching through I could not tell (at all) which direction the crevasse ran under the snow. In fact, on the entire visible portion of the White Salmon Glacier, there were a grand total of ZERO visible open crevasses prior to my incident. I have always been very cautious of and hesitant to engage in glacier travel under wintery, powder-snow conditions, due to this specific risk of thinly-bridged crevasses and the lack of visual clues to their location. Such clues become so much more evident to the practiced eye in well-consolidated, spring and summer corn snow conditions (sags, dirtier snow, color variations, etc). So in light of this incident, it seems that my winter-snow cautions were well-founded, yet I chose to deliberately ignore them this time. However, I also know that I have been getting overly confident, perhaps even cavalier, in my glacier travel habits over the past several years, and this incident certainly provides a much-needed reality check and a sobering note of caution for the future. Anyway, back to the main story line: We decided to keep going after the crevasse punch-through, giving that spot a wide berth and continuing skinning in switchbacks up the ever-steepening slope, sometimes following the skin track of the skiers who had traversed in above (already wind-drifted full of snow within an hour), sometimes not. 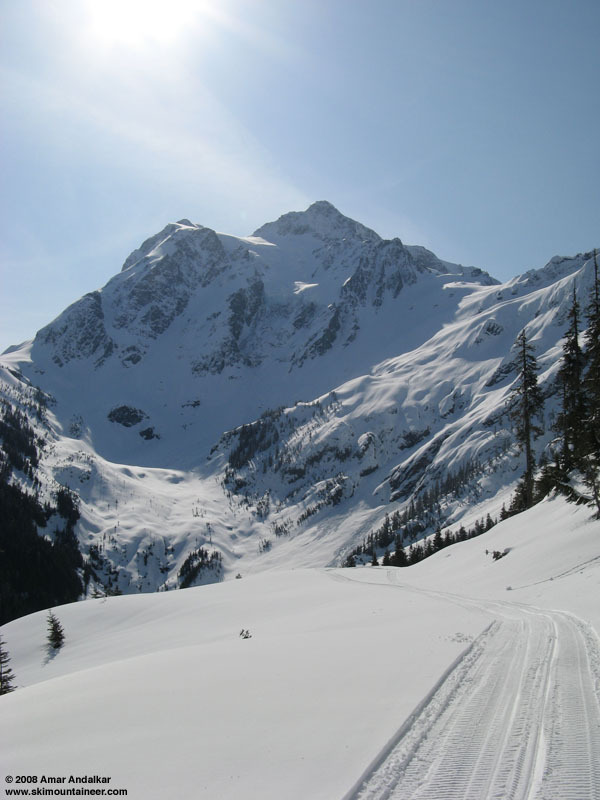 I remained nervous and shaky for quite some time, and was having a bit of difficulty following the powdery, occasionally loose, skin track across the steep slopes. We finally reached our high point on a flat at the base of Winnie's Slide, roughly 6850 ft at around 2pm, and stopped for a leisurely break. View of Mount Baker from our high point at 6850 ft.
We skied down at 2:30pm, finding still-excellent deep powder conditions down to about 5000 ft, except for a few areas of denser windpack and minor windslab. 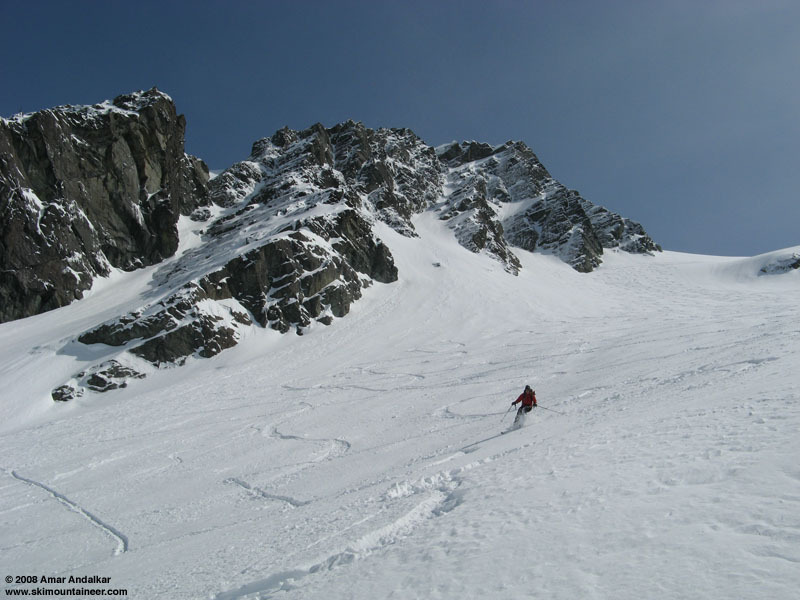 The snow was very stable, and no avalanche activity was observed other than very minor sluffing of the unconsolidated powder. Below that, the snow became a mixed bag of various crusts and soft wet snow, but not very sticky or hard to ski. We skied down to about 3400 ft and then skinned back up along the morning's downward traverse track to reach the ski area around closing time at 4pm. Kellie carving up the pow, with our tracks and others visible above. Mount Shuksan in the late afternoon. Glad you're and everyone in your party is okay. That's a scary thing. I had a similar experience skiing the Spearhead Traverse about 5 yrs. ago. Two of our party of 4 skied right across a crevasse which was totally unremarkable. The 3rd person was right in my tracks and went in over his head. He had 1 of our 2 - 30m ropes, but at least I had the other. We quickly set up a belay and helped him out. This was an early april trip with a normal or better snowpack; supposedly the safest time to travel our NW glaciers. Since then I've tried to ski glaciers with a harness on and have at least 1 if not 2 (depending on party size) ropes of 30m, which only weigh 2-3 lbs. Glad your experience ended so well. Skip E.
Nice report. It was good seeing you guys up there and thanks for the in the field heads up on the crevasse & slabbage action. My buddy & I intended on a summit bid the next morning, but contented ourselves with doing some laps before it got too warm. Hello, that was us above you that day except we didn't traverse in from the arm - we ascended the ridge on climber's right and then traversed across at about 2/3rds of the way up when we decided it looked easier to get to Winnies on that side. Where on the track did you find that crevasse?� Was it before or after you joined our track?� I'm glad to hear you came out ok.� Crevasses were the last thing on our minds - we had neither ropes or harnesses!� If you look at the picture in the Beckey book of the WS in the summer its hard to believe its even the same place. If your skin track was the one zig zagging toward the top of the White Salmon just before the plateau, then the crevasse was much lower down (fairly close to fall line from your skin track up high). I think it is a 'shrund associated with one of the rolls (aprons) climber's right of the Hanging Glacier. I've gone up the gut in February in a crappy year & know the crevasse danger doesn't exist there; however, our party chose to go climber's left of the main route.